The Omnibus faded from the scene with the coming of the horse railways. 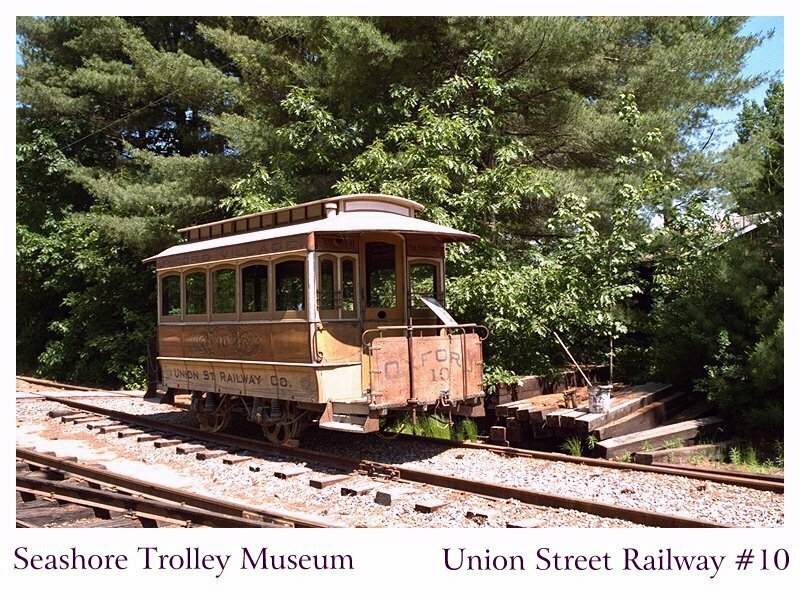 The use of rails greatly improved the comfort and speed of the horse drawn cars, not to mention an improvement in the efficiency of operations. On the hard, smooth rails the cars became larger, accommodating more passengers, while using less horse power. As with most changes, there was a resistance, at first, to the use of rails in the street. It was feared these rails would interfere with other carriages using the streets, destroy property values along the routes and drive customers away from the stores along the routes. Very shortly it was proven to have had just the opposite effect. Initially the cars very much resembled the omnibus, with the driver perched atop the carriage. Around the time of the civil war the design of the carriages was changing. The driver was removed from the top and found his new position on the platform of the car. The passenger could now board from the side of the car rather than the rear. This also now allowed the use of double-ended cars, eliminating the need of turning the cars at the end of the line. The horse (or horses) was simply unhitched and led to the other end of the car. The braking lever was replaced by a wind up cranking mechanism on the platform. 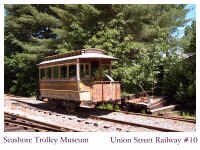 It has been reported that by the late 1880's there were over 500 horse car railway lines running in some 300 cities around the U.S. Over 100,000 animals were used in these operations. Horses weren't the only animals in use. Mules became a popular means of power as well, especially in the south, as it was said that they withstood the heat better and required less in the area of food and care. While the horse might have run from $150 to $200 each when bought by the railway, probably half that cost could be recovered by the sale of the horse once it outlived it's usefulness to the railway. This was not true of the mules however. While their initial cost wasn't near as high as that of a good horse, there was little market for the old mules. Over the years there were several interesting ideas that were tried and probably worth mentioning. As we still see today in railroading, grades are always a problem. 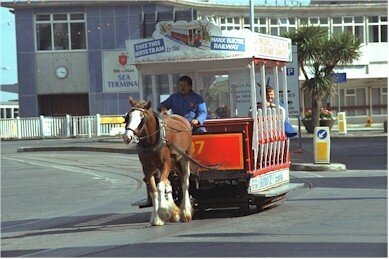 During the horse car era there were a few cars designed so that after once conquering the hill, the horse was allowed to board the car and ride back down the hill. Starting the cars always takes more power than it takes to keep it running. With this in mind an idea was tried that used a winding spring arrangement that used the moment um of the rolling car stopping to wind the spring, the driver then releasing the spring when the horse tried to start the car. Another idea involved using what was called a "sprag". It was simply a sturdy piece, hinged at the car with the other end dragging the ground. Once stopped, on the hill, the car could be held from rolling back by its digging itself into the ground. It was common practice to add horses for the trip up the hill much the way locomotives today are added to a train to get over t he steeper grades. While it certainly varied from route to route, the average horse was expected to work only 4 or 5 hours a day, or put another way, pulled his load over 12 to 15 miles per day. The horse had to be stabled for the rest of the day as well as having to be fed, usually three times a day. In a day a horse consumed about 30 pounds of feed and hay. Generally it required one hostler for each 15 to 20 animals, as well as company vets etc. The horse working so few hours a day meant that the railroads needed far more horses than they did cars. As example, the Metropolitan Railroad in Boston used 3,600 horse to operate its 700 cars. With that many horses the manure becomes a problem, not just on the streets but even more so at the stables. The manure could be sold off for tidy sums but before being sold it was accumulated in large piles, at the stables, which gave off some pretty terrible odors, causing numerous complaints from the neighbors. Manure was always a problem. Horse railways were expensive to operate and even in the better days generally returned only 8 or 9 percent. This was due mainly to small cars and slow speeds with operating costs around 25 cents per mile, per car. Except in the larger cities, most horse railways remained small, operating only on one or two routes, often with other companies offering competing service only a few blocks away. Said to have come from Europe originally, the "Great Epizootic", an equine influenza, first turned up in Canada, in mid October 1872 and very quickly spread throughout the Eastern United States reaching as far as Louisiana by the end of November. Thousands of horses died and many more were too sick to be called upon to work. 18,000 horses in New York alone were to sick to work while at the same time horses in Philadelphia were dying at the rate of 175 to 200 a day. More than 2,250 horses died in that one city alone during a three-week period. The epidemic spread so far and so fast that it baffled the veterinarians, as well it could not be explained as being from contact of one horse to another. Horse car operations were brought to a halt in many areas and in some areas oxen were tried. In New York large numbers of the unemployed were tried as power to pull the horse cars. This epidemic of course was not just confined to railways and during the height of the epidemic came the "Great Boston Fire". One reason given for the fact that the fire spread out of control for so long was that there were few horses to haul the fire wagons to where they were needed. The fire consumed 67 acres of the downtown Boston area with an estimated 75 million dollars in damage. Winter use of the horse railways was another interesting topic. Heat in the cars was generally not available. Usually 8 or 10 inches of hay, as insulation, was all that was used to make the ride more comfortable. Coal stove heaters were occasionally used but these would, every once in a while, set the car on fire. Another problem occurred that upset many people. Until now, snow was not plowed but rather walked or sledded on. With the other carriages using the roadway now having skis, or sleds or sleighs they encountered problems when they came upon a plowed railway. Some cities passed ordinances forbidding the railway companies from plowing the tracks. Many railways were forced to keep sleighs in the carbarns so they could provide, at least, limited service. While the horse railway was effective and did the job, a better means of powering the cars was clearly necessary.